The majority of our industrial customers turned to Stage 8 when a critical fastener loosening problem severely affected equipment availability, maintenance costs, and safety. All of the Stage 8 locking systems (Abutment, Counter Bore, Bridge, and Spindle Nut) have been applied in a wide range of industrial applications with a 100% record of success. A typical industrial inquiry will focus on a bolt, cap screw, or spindle nut application that has been failing in service due to vibration, thermal cycling, or whatever service environment problem there may be. Stage 8 will design a prototype solution and manu facture the locking system to accommodate load, corrosion, clearance, and material requirements. Our customers will test the prototypes in service to assure performance. We are always gratified to participate in a shaker, fatigue or real-world test since we consistently come out #1 in comparison to all of the alternatives. Stage 8 has celebrated our 25th anniversary in business, and we have developed excellent long term working relations with a wide variety of product and service providers. This, in combination with our small business versatility and quick response, allows us to respond to opportunities with prototypes and engineered solutions in an extremely short time period. 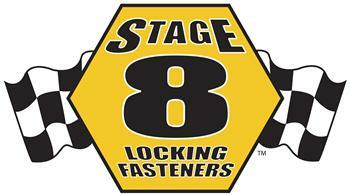 Stage 8 Locking Fasteners are available in standard or custom Inch and Metric sizes, are easily installed without special tools, and can even be removed and reused if necessary. Millions of our locking fasteners have been installed without a single failure.